‘Mary Gibson is going to go a long way… a really good read’ Dee Williams. 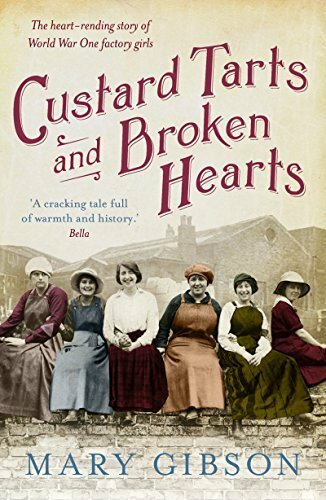 They call them custard tarts – the girls who work at the Pearce Duff custard and jelly factory. But now the custard tarts are up in arms, striking for better conditions. Among them is Nellie Clark, trying to hold her family together after the death of her mother. She has the most desperate struggle to make ends meet, often going hungry to feed her little brothers. Two men vie for Nellie’s love. One is flamboyant, confident and a chancer. The other is steady, truthful and loyal. But the choice is not as easy as it might seem. Looming over them all – over Bermondsey, over the factory, over the custard tarts and their lives and loves – is the shadow of the First World War. And that will change everything and everyone. I got this book when the ebook was on sale and really enjoyed it. I have read a lot of books about WWII, but haven’t read a lot of books on WWI, so I enjoyed this. I plan to read the other books in this series.